As I chatted with coworkers about our Thanksgiving plans, I realized that Thanksgiving might be my favorite holiday. My boss said it best: It’s a time to come together, to share, to break bread, to enjoy–without the gifts, the frills, the sparkles. It’s a day to push innovation aside just a little and cook what comforts, what’s familiar, what’s easy. I hosted Thanksgiving dinner this year for the first time. Christmas is usually mine. I’ll bring dessert, some sides, some overly pushy (but always sage) advice to Thanksgiving dinner. But this time it was mine. All mine. And considering Thanksgiving was wiped off the calendar for me due to illness last year, I was excited. Well, it didn’t really end up going according to plan. Ok, it was a real mess. But I’ll always remember it. And now that it’s over, laugh about it. The dinner was simple; after all, it unexpectedly turned out to be a dinner of three instead of five. Strike 1. But it was lovely: Cranberry Chutney with Fennel and Golden Raisins was the only published recipe I used, but if you have access to it, I encourage you to save it in your file, because it’s fantastic; a salad of endive, fennel, grapes, blue cheese, and walnuts with a refreshing vinaigrette (I need to think of a better name for that) made for a light side; these buttermilk dinner rolls were, as I expected, excellent butter and gravy mops; my good friends Mrs. Browned Butter and Mr. Sage elevated butternut squash puree from baby food to, um, best side dish ever; green beans topped with a modest amount of caramelized onions made me thankful I’ve never been subjected to the real green bean casserole; the turkey, a breast this year since I’m the only one in the family who likes loves dark meat and was out-voted (I’m still bitter), tasted so intensely turkeylike thanks to some advance dry-brining (I also dry-brined my hand…long story, but, yeah, Strike 2), a compound butter of mixed herbs, shallots, and honey flavoring but not overwhelming that deep, almost gamey taste; potatoes and turnips roasted underneath the bird were flavored and nicely lacquered by those rich turkey drippings. Ok, so you’ll notice there was no dessert. Nope, no dessert. The pie lady made no pie. Strike 3. I had a Thanksgiving fail. Everyone does their first time, when they’re going it alone, right? Right? A weekend in advance, I had made, rolled, and crimped my crusts for pumpkin and apple pies. I cut out leaves with the scraps and got those ready for merry fall embellishments. Apples were lined up, ready to be peeled; pumpkin purée and brown sugar were reducing and caramelizing. And plates fell from freezer to ground. It was heartbreaking. Pie means something to me. I’ve always felt something special, something I can’t articulate when dough making, rolling, fitting, shaping, filling. To see that shatter (literally) before my eyes killed it for me. Could I have turned that pumpkin filling into crustless individual custards? Yeah. Could I have dumped those apples into a dish and made a satisfying crisp? Yeah. But there would be no holiday without pie, no Thanksgiving without pumpkin. Oh, isn’t it ironic? Isn’t it so damn perfect that just a couple of weeks ago, I gave my mom’s Swedish Apple Pie a light bashing, calling it good but a shortcut and not real pie. But Sunday, before returning to work on Monday, I saw those apples staring at me. They were bought for dessert and they deserved to be used. After Thursday’s tragedy, which took the life of my favorite old-school Pyrex pan, I couldn’t bring myself to make a post-Thanksgiving pie. Well, a pie-pie. I could make a half-pie. I present you with Swedish Apple Pie. Ok, not any Swedish Apple Pie. I felt like tinkering. 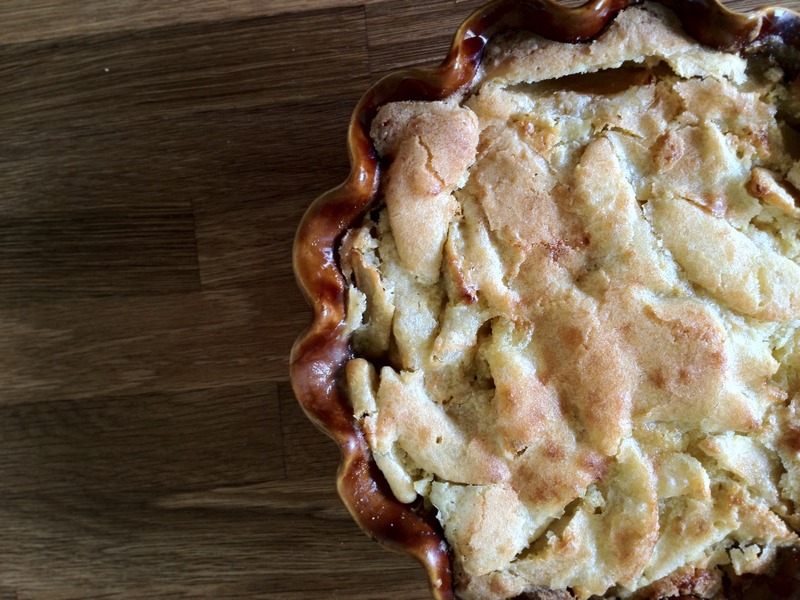 It’s a Cornmeal-Ginger Swedish Apple Pie. If I was a fan of quotation marks, I would call it Cornmeal-Ginger “Swedish” Apple “Pie.” This isn’t the one my mom made and it isn’t the one your mom made, but it follows the same formula, so it’s super-easy, with a few improvements, so it’s super-flavorful. It’s the perfect post-tragedy upper. Instead of merely slicing apples at any width and plopping them in the dish, apples are sliced uniformly, tossed with a little bit of sugar and other flavorings and macerated. (Does this sound familiar?) Then, the juice they exude is reduced to an intense apple caramel, which is poured back over the apples. Cornmeal takes the place of some of the flour in the topping, giving it texture, and the sweet taste of a really cakey cornbread. Mmm, cornbread. Spiked with fresh, ground, and crystallized ginger, the flavor of the filling and topping mesh seamlessly. Lemon zest and juice brightens it up. The cornmeal-ginger-lemon combo transforms this humble cinnamon-apple dessert into something that uses apples to straddle both fall and winter. The magical “crust” forms, becoming delightfully crunchy and sugary on top, and some of the topping seeps through the cracks in the apples, making this dessert cobblerlike yet sliceable like pie. Trust me, it certainly ain’t pretty, but paired with melting vanilla ice cream (a requisite accompaniment), it soothes, healing any wound. And the whole incident gave me an excuse to share just one more apple recipe with you before it’s officially December. And, I admit it, it was damn good. Tragedy never tasted so sweet (or spicy!). If you prefer the servings of pie to come out more like cohesive slices or “real” pie, almost like a very apply cake (as my mom prefers, so I did it here), loosely pack the apple slices into the pie plate so that batter can easily sink into the gaps. If you prefer the servings of pie to come out more like servings of fruit cobbler (as I prefer), pack the apple slices into the pan close and tight. Some filling will still sink, giving you a more sliceable dessert. This pie is best baked in an 8.5 to 9-inch deep-dish pie plate so that the topping doesn’t overflow the dish. 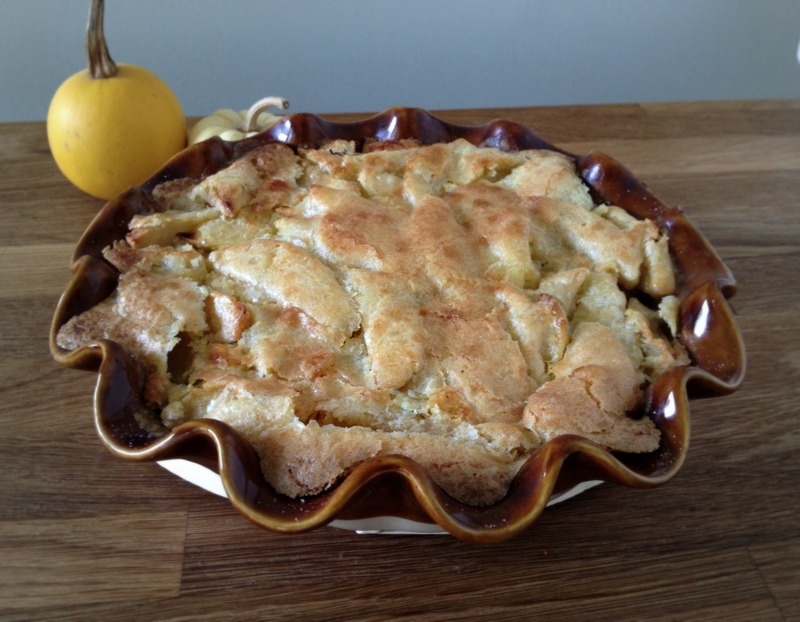 If you only have a standard 9-inch pie plate, fill it with less apples. Although I haven’t tested it, an 8 or 9-inch cast iron skillet should also work. Combine apples, brown sugar, lemon juice, 1 teaspoon fresh ginger, ½ teaspoon ground ginger, and 1/8 teaspoon kosher salt in a large bowl and toss to coat apples. Let stand for at least 1 hour and up to 3 hours. Center an oven rack in middle position and heat oven to 350 degrees F. Line baking sheet with aluminum foil. Drain apples, transferring exuded liquid to small saucepan. (You should have about ¼ cup liquid.) Bring to boil over medium heat and reduce until you have about 2 tablespoons (or half your original amount). Add the reduced liquid back to the apples along with 1 tablespoon of flour and toss to coat. 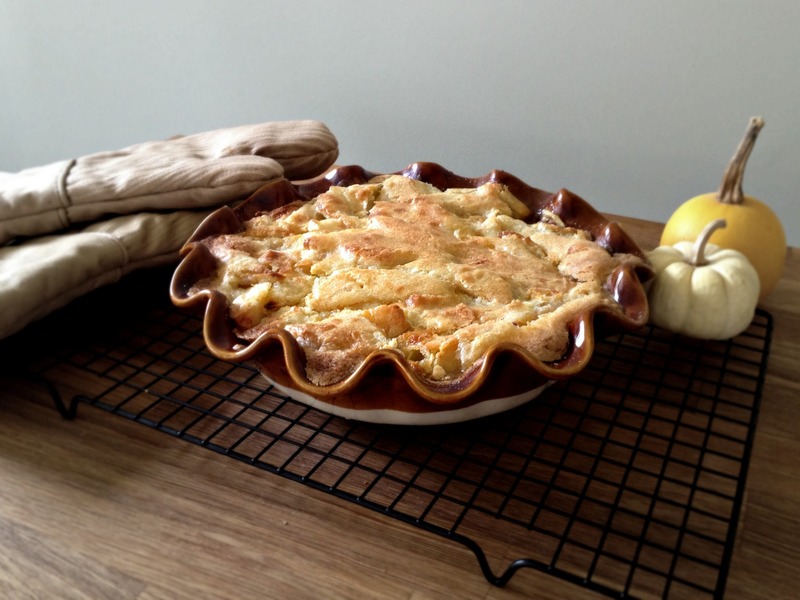 Empty into pie plate*, pressing down and evening out the apples as you wish (see recipe headnote). Melt butter in small saucepan. Meanwhile, whisk together remaining ¾ cup plus 1 tablespoon flour, all but 1 tablespoon granulated sugar, cornmeal, crystallized ginger, baking powder, ½ teaspoon ground ginger, and ¼ teaspoon salt in medium bowl. Whisk lemon zest and remaining 1 teaspoon fresh ginger into melted butter. Whisk egg and butter-ginger mixture into dry ingredients until fully incorporated and let sit until spreadable but slightly thickened, 3 to 5 minutes. Using rubber spatula, spread topping evenly over apples. Sprinkle remaining 1 tablespoon sugar evenly over batter. Set pie plate on prepared baking sheet and bake for 50 minutes to 1 hour or until apples are tender, top is browned, and toothpick inserted into pie comes out with just some moist crumbs attached. Let pie cool for 45 minutes before serving. *Because we are now deep into the season, I used 3 granny smiths for tarts and 2 Braeburns and 1 Golden Delicious for sweets. During peak season, Empires, Mutsus, and Jonagolds are excellent additions to the mix. **You can eyeball somewhere between ¼ and ½ inch, just as long as the slices are similar in size so they cook fairly evenly. I guess it all worked out in the end :). Ugh…that breaks my heart for you. You must have felt crushed. Hosting is definitely an experience. This was my 5th or 6th time hosting a large party for a holiday and while I’m getting better at managing my time and dishes, it’s still a bit chaotic, but I love it. I also have never had the “real” green bean casserole and have zero desire to ever have it. Our green beans had a simple fried shallot topping. They were delicious. 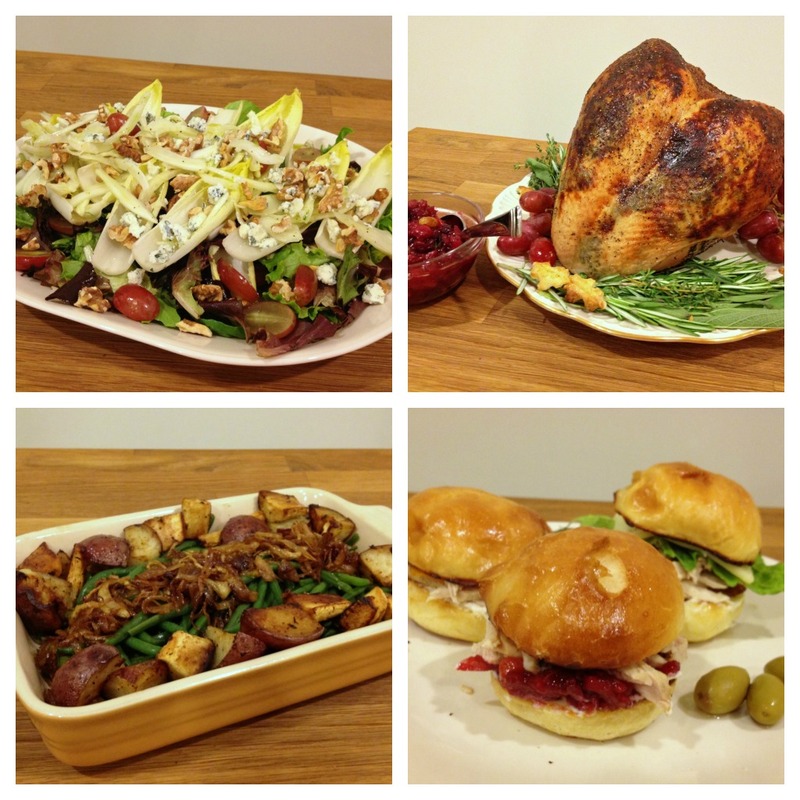 As was our dark meat…sorry you missed out. I figure I can sacrifice one thing for the holiday, even though I love my dark meat. I will say, cooking a turkey breast was a breeze, so I didn’t mind that part :). Ack I am so scared of dropping dishes before they get to the oven too! Glad to know your Thanksgiving was lovely, in spite of the lack of pie. You sure made up for it with this one! I’m usually nervous about dropping hot things coming out of the oven. At least I know things can (hopefully) only go up next year! 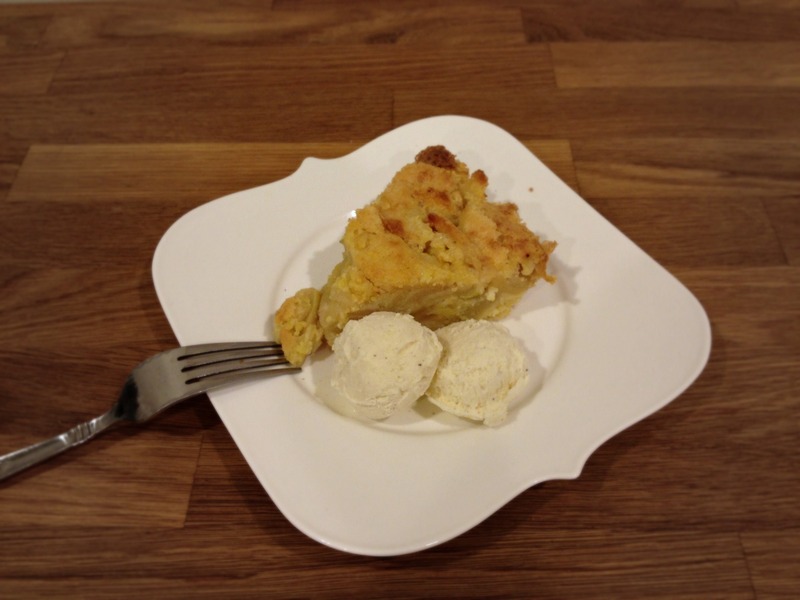 It’s really hard not to love Swedish apple pie. This version is good, but I’d never turn down the classic version–even if I have eaten it a good 50 times. Ouch. Looks like you made a great recovery though. I am so impressed at everything you made for thanksgiving. The pie mishap breaks my heart. You did a heck of a job improvising! Thanks! But I’d definitely choose your Thanksgiving over mine :). Dropping a dish sounds like my worst nightmare!